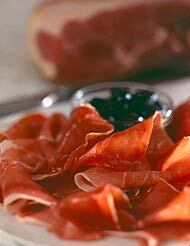 Welcome to Iberian Foods - the premier suppliers of Spanish foods to the UK. Our products include a range of the finest quality Spanish foods, including Jamon Serrano (serrano ham), Jamon Iberico (Iberian ham) otherwise known as Pata Negra or black foot ham. All our Spanish foods including our serrano hams are procured in Spain and are despatched direct to you in the U.K. Why not visit our online shop where you can buy the finest Spanish food and have it delivered direct from Spain? Traditional Spanish food is unpretentious and simple. It is the subtlety of flavourings and combinations of ingredients which make it very special, sometimes truly inspired. Cooking in Spain today is still largely the fare of the pueblo kitchen, only the utensils and methods of buying ingredients have changed. Once provisions arrived by donkey from nearby fields and fishing ports, now they arrive by refrigerated truck from all over Spain - and indeed from across the World. Culinary cross - fertilisation is nothing new in Spain, it goes back certainly as far as the Phonecians who landed on Spain's Mediterranean coast and brought with them Mojama - an air cured type of tuna. 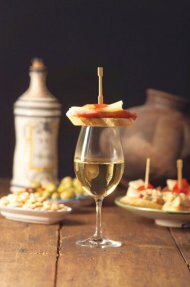 The Romans are thought to have introduced olives, figs, grapes and wine. The Moors and the Arabs who controlled much of the Iberian peninsula for some seven hundred years contributed greatly, not only by introducing rice and sugar cane along with a host of previously unseen fruits and vegetables, but also by creating complex irrigation systems enabling previously hot barren land to grow crops. The discovery of the Americas brought potatoes, tomatoes, peppers, chillis, beans, avocado and chocolate. Gazpacho the Moorish cold vegetable soup didn't become so well known until tomatoes came from the New World. Browse our Spanish recipe pages and find authentic recipes for Spanish foods including serrano ham such as Habas con Jamon (serrano ham with broad beans), as well as traditional Spanish recipes for Mojama (air dried tuna), and Bacalao (salt cod). If you fancy Chorizo, or Lomo a cured pork loin, there are lots of Spanish recipes to bring back the memories of your last visit to Spain. And dont forget to visit our online shop where you can buy a whole range of Spanish foods and have them delivered direct to your door by the premier suppliers of Spanish food to the UK - direct from Spain!